Let's take a moment to tally a few of 2013's highlights of astronomy and space exploration. In brief, it was a very good year on a number of fronts. Curious about Mars? Then it's been a good year for you, 2013 being yet another year in a long unbroken succession where Mars still stands out as one of the most intriguing places to explore. NASA's rover Curiosity, resident on Mars since August 2012, has turned up a number of tantalizing clues about Mars's past. Though its primary mission to climb the slopes of Mount Sharp and read the layers of sediment that were built up over a couple billion years still lies ahead, Curiosity's preparatory activities at the mountain's foot have already struck pay dirt. River-bed-like gravel matrix. Interesting as dirt! Curiosity happened upon a bed of gravely stones in a solid matrix that strongly resembles formations on Earth left behind by the past action of flowing river and stream beds. Water now? We've known of water on Mars for some time now: water-ice locked up in the polar caps and under the soils of the vast northern plains, and also water molecules bound up in minerals. One of Curiosity's primary goals is to assess the past conditions on Mars to determine if they were ever suitable for the existence of life (as we know life)—that is, was there ever liquid water there? After a year of prospecting, including analysis of rock samples ground out of a deep (2.5 inch) bore hole and chemical measurements with other instruments, the presence of water chemically bound up in the minerals of Gale Crater is now well established. No methane detected. One surprise from Mars this year was the failure of Curiosity to detect methane gas in the air—and it is not a failure of Curiosity's instruments, but apparently a true dearth of this simple hydrocarbon. This was a surprise because earlier measurements by other spacecraft suggested the presence of methane—one source of which on Earth are living organisms. This does not rule out the possibility of life on Mars today, but is a bit like a puzzle piece that doesn't fit as expected. On another frontier, NASA's Juno spacecraft, launched in 2011, made a gravitational slingshot maneuver around Earth this year that sent it on a final trajectory to its target destination, Jupiter. Juno is destined to enter an orbit that will carry it over Jupiter's polar regions, which have never before been scrutinized directly and up close. Juno will not only show us the detailed face of Jupiter's northern and southern cloud tops, but by measuring the magnetic field emerging from within we hope to learn some things about Jupiter's deep interior and core—analogous to how we can study properties of the Earth's interior by examining what comes out of a volcano--well, sort of. 2013 was a great year for finding Earth-like extrasolar planets, even though it was not such a good year for NASA's Kepler mission, the space telescope that was designed to look for "other Earths." Though we had to say goodbye to Kepler when it experienced a critical technical failure in May, astronomers are still finding exoplanets within the hordes of data Kepler collected in the three years before its demise. Planet candidates detected: To the date of its untimely end Kepler amassed a pool of 3538 candidate planets, a large percentage of which are expected to be actual planets. Planets confirmed: Kepler has confirmed the existence of 199 planets, a number that is likely to grow by leaps and bounds as astronomers continue to analyze data from Kepler and other observatories. Earth-sized planets found in habitable zones: Kepler set out to find Earth-sized worlds orbiting within their stars' habitable zones, the range of distance within which water might exist in liquid form on a planet's surface. Fortunately, Kepler accomplished this goal—more than once—showing us some other worlds in our neck of the Milky Way galaxy that are considered prime candidates for being able to support life. The most recent of these are Kepler 69c, Kepler 62e, and Kepler 62f. Voyager 1. And the last shall be first.... Voyager 1, launched to explore the outer solar system's gas giant planets 36 years ago, officially became the first human-made object to enter the realm of interstellar space. 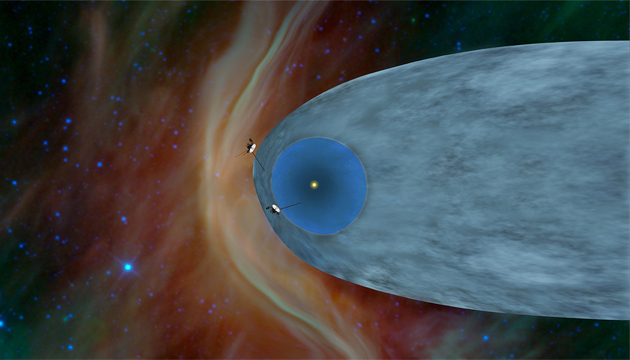 About 12 billion miles from our Sun, for the past year Voyager 1 has apparently been traveling through a region of plasma (ionized gas) outside the boundary of the Sun's vast extended atmosphere, which forms a gigantic bubble as it pushes outward against the interstellar medium—the gases found between the stars. Visions of a once wet and more Earth-like Mars, of possible Earth-like planets around other stars, and of humankind taking the first physical step into the greater Milky Way galaxy beyond our solar system. Yes, it was a very good year in space….